This beautiful looking and delicious tasting soup is easy to make, and with the addition of a few special toppings it makes a satisfying meal. The hint of ginger and lime bring an oriental influence to this classic autumn favourite. Enjoy! In a large pot, warm the olive oil. Add the onions and cook, stirring frequently, until soft and translucent, about 10 minutes. Do not brown. Add the spices and cook a minute more. Add the carrots, sweet potatoes, stock powder, water and salt. Cover and bring to the boil. Remove lid and simmer over a low heat until vegetables are very tender, about 25 minutes. 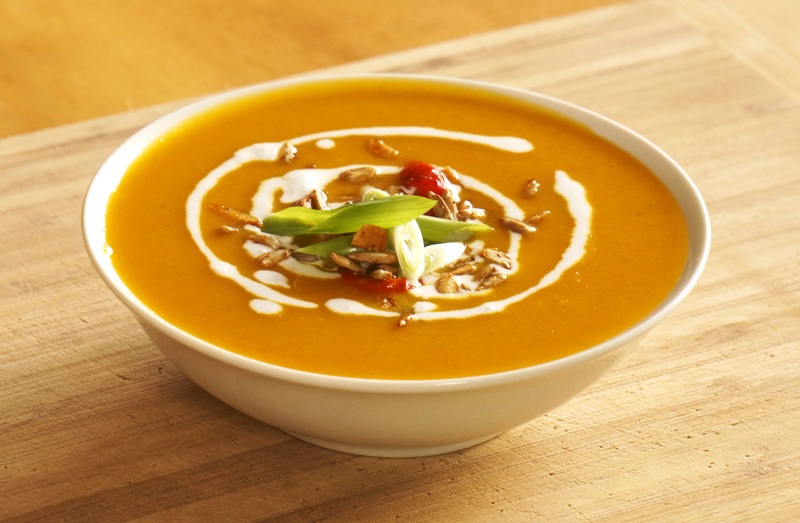 Using a stick blender, puree the soup until smooth and creamy. (Alternatively, cool the soup slightly, then puree in a blender in batches. Be sure to leave the hole in the lid open, and cover with a kitchen towel, to allow the steam to escape. Season to taste with salt, and add a little honey if necessary (sometimes the vegetables are lacking natural sweetness). Ladle soup into bowls and drizzle generously with coconut cream. Sprinkle with savoury roast sunflower seeds & almond slices, sliced spring onions and roast capsicum. I love to accompany this meal with some great toast, avocado, salad, sliced tomatoes and roast eggplant, zucchini and capsicum. Yum! yumm this soup looks delicious!! !